Flange Connection and Brine Tank - Philadelphia Instruments and Controls, Inc. - Specializes in the production of temperature related products. Thermometers 7" and 9" scale case V-Shape bronze case, glass front. Stems on the listed thermometers are four inches measured from bottom of flange. Longer stems can be supplied at a slight extra charge. Long stem thermometers for insertion through the top of tanks. 45° reclined thermometers are easily read from a standing position when tanks are located under the floor. 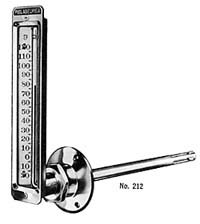 Thermometers are fitted with adjustable flanges.